Is there a better sandwich than a BLT? The smoke and salt from the bacon, as well as that meaty umami, a little acid from the tomato, a wet crunch from the lettuce and a little mayonnaise to keep the bread dry and add a little creaminess. On a par-baked roll right out of the oven, it was a great lunch. We served two rolls each. Lettuce and eggless mayo add another 25c per serve. Lunch today was a big serve for $3.14 each. Two thin cut pork chops from our Prather Ranch delivery had been dry brining overnight. Tonight we smoked them and paired with caramelized pearl onions and apple, braised in apple cider. To offset some of the sweetness of the cider we swapped 1/4 for apple cider vinegar, which definitely offset the sweetness! Because they were thin cut, we didn’t want to risk over-cooking by frying them off for a better appearance. The result of the salty brine and smokey preparation was very hammy and delicious. Tonight’s restaurant-worthy meal cost just $6.85 and a little prep time and was a great meal. 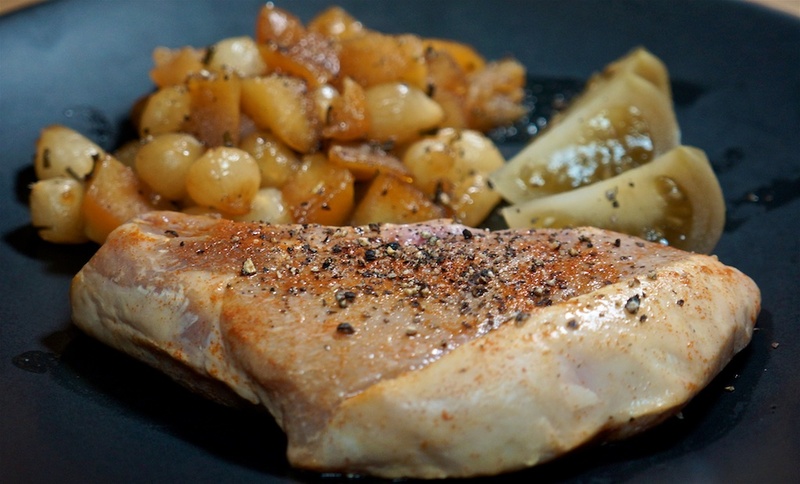 The pearl onion and apple worked really well as a variation on the “apple and pork” cliche. For lunch we added a burrito stop to our shopping trip. Lunch today was $6.00 per serve – a slight increase. 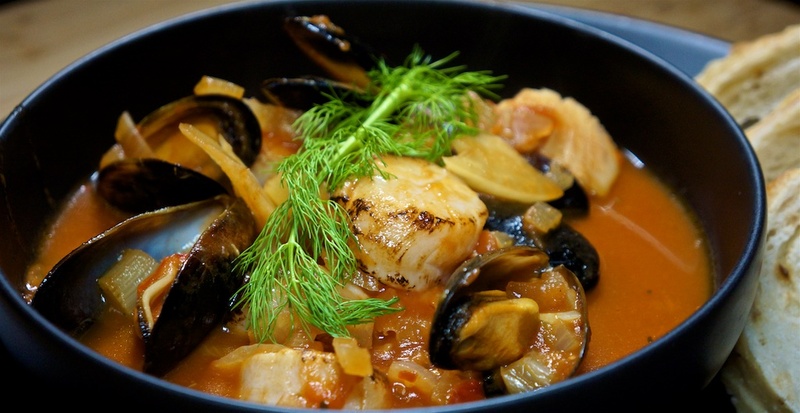 Dinner at home with a friend, so we cooked the cioppino base and then added mussels, scallops and cod for tonight’s meal. They were extracted from the stew and served with a generous amount of the broth. The balance of the broth mix will be used to cook up some more seafood later. Dinner tonight cost $9.26 a serve with a very generous amount of broth left to cook up the next meal and much more generous servings of mussels, scallop and fish than a more expensive restaurant meal. A cold and somewhat windy day so we went for a soup option: Progresso Manhattan Island Clam Chowder – a clam chowder without dairy. This is a simple ‘heat and serve’ soup without adding water or dairy. One $2.00 can makes one serve. A nice warming beef beef massaman curry seemed appropriate and we used for the cold evening, and to use beef chuck eye steak from our Prather Ranch meat bounty! While this would normally be done with stewing meat we sliced the raw beef and gently simmered it to temperature in the curry at the end. Beef massaman is warming without being too spicy. 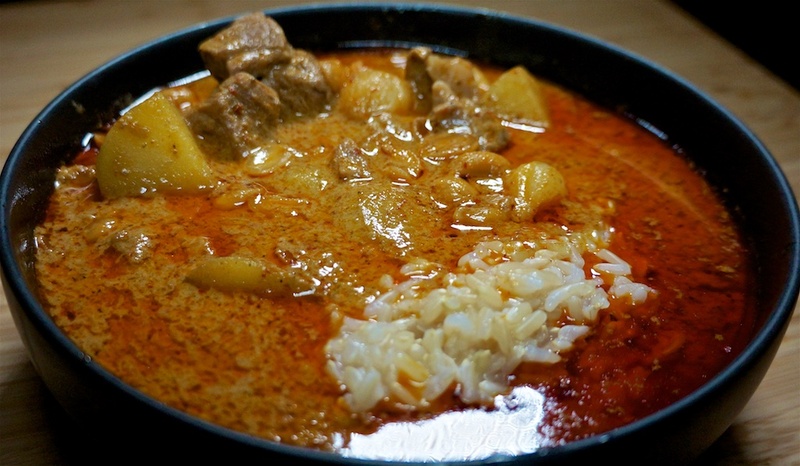 We use a curry base we buy from Amazon for this simple, quick meal. The bunch of carrots was 89c but we used half in this dish, or 23c per serve. Dinner tonight was perfect for the weather: delicious and warming but a little expensive at $9.45. A nice sunny day before the wind kicked in, so we toasted an onion bagel each, and filled it with avocado, capers and smoked salmon. Delicious. Lunch today was generous and delicious for $3.90 per serve, but would have been better with a little thinly sliced shallot. 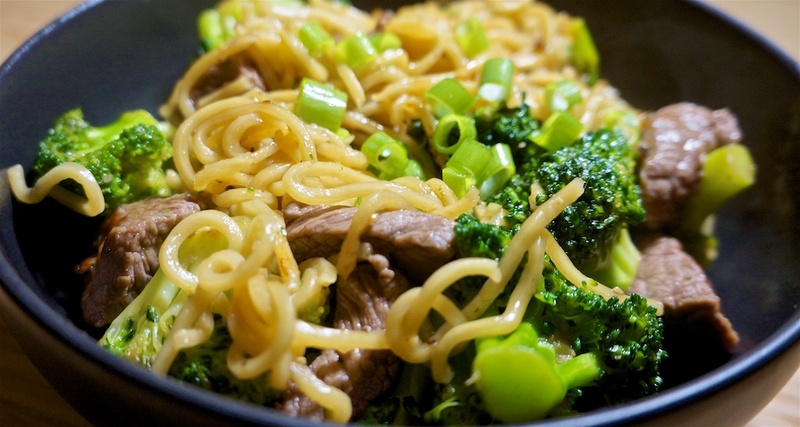 Once again we had Emeril Lagasse’s Stir Fried Beef and Broccoli but sliced up a top sirloin for the beef and used udon noodles. This is a very simple dish, but very tasty. We upped the garlic and ginger in the sauce and replaced the honey with sweet chili sauce. We don’t mind a bit of spicy heat! The broccoli florets where $3.49 or $1.75 a serve. The top sirloin came from our farm-direct meat delivery for $11.43 or $5.72 per serve. The noodles were $1.99 for the pack, or $1.00 per serve. Dinner tonight cost $8.66 per serve. Lunch used the last half of a chicken breast, along with part of a salad kit from Trader Joe’s. The chicken is $9.99. Divided into four portions or $2.50 each, one breast is split into two serves, or $1.25 per serve. Lunch today was $2.58 per serve. Tonight was the monthly LACPUG meeting, followed by pizza and wine at Palermo’s. We each contribute $5 to cover expenses. Tonight’s meal cost $5.00 per serve. Lunch used another half of a chicken breast, along with part of a salad kit from Trader Joe’s. Basically left overs: the remaining Popeye’s fried chicken with another two serves of the Jamaican rice and peas. The rice and peas cost $1.22 per serve. Dinner tonight cost $5.57 per serve. Another Burbank Monday had Philip at In and Out Burger for lunch. A Double Double is $4.08 with tax. Time to use the chicken legs (thigh and drumstick) from our supermarket roast chicken this week. Tonight we paired it with Jamaican rice and peas, which are really beans. The recipe makes six serves. The chicken was steamed over the cooking rice. The rice and peas was okay, but it needs more beans, and we found a generous sprinkling of Trader Joe’s Lime and Chili and some fresh lime went a long way to improving on the recipe. Add 10c per serve for seasonings and oil. Tonights ‘rice and peas’ cost $1.22 and with the chicken, $3.72 per serve. With our improvements, the rice will be better tomorrow night. 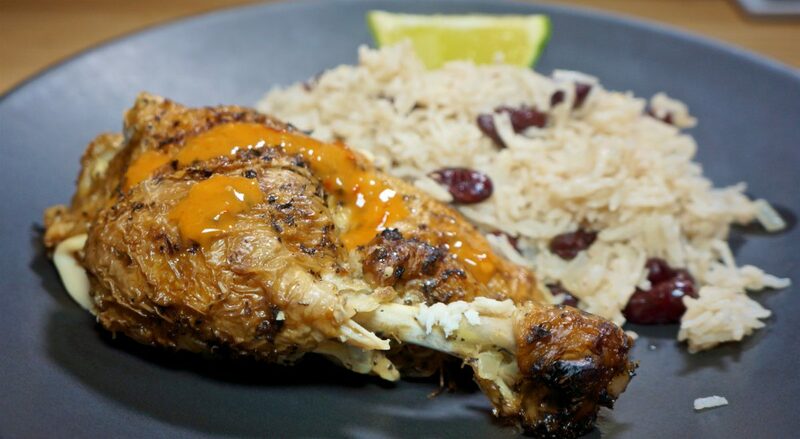 A little piri piri sauce gave the dull chicken some interest. Since we were out unsuccessfully shopping at home improvement stores, we decided to reward ourselves with some nice hot fried chicken. It’s funny how much Popeye’s prices vary for the same order between different stores: definitely lower in Burbank and highest in Simi Valley. Red Beans and rice $2.34 per serve. Lunch today cost $6.70 per serve. Tonights’ dinner was an exact repeat of last night’s: pork tom kha gai with naan. Including the naan, tonight’s really tasty meal, cost $5.17 per serve. A rare sunny day so we toasted an onion bagel each, and filled it with cream cheese, capers and smoked salmon. Delicious. Cream cheese and capers add 40c. Lunch today was generous and delicious for $3.90 per serve. Having decided that we were not being inventive enough with our pound of ground pork that comes in our Prather Ranch box each month, and somewhat constrained from dairy because of Philip’s sensitivity, Greg decided on a pork version of Tom Kha Gai with the pork substituting for chicken. This version has a lot more flavor from the crisp-fried pork than any chicken version we’ve had. A success. The combination of flavors are exceptionally well, although we felt we could add a little heat. A little research supported that: tom kha gai is served with a chili oil! The recipe made four serves, and we served with naan bread. Nothing like breaking down cultural barriers! A four cup carton of stock is $2.39 and we used four cups of chicken, and two cups of mushroom broth, or 90c per serve. A pack of four naan are $1.99 or 50c per serve. Another cold and rainy day pushed us toward something warm for lunch, so we did our version of a quesadilla made with flatbread, and added half a chicken breast to it. Lunch today cost $2.51 per serve. We had Beef Short Ribs remaining from an earlier Prather Ranch delivery and the weather made having an oven on for a long time very attractive. 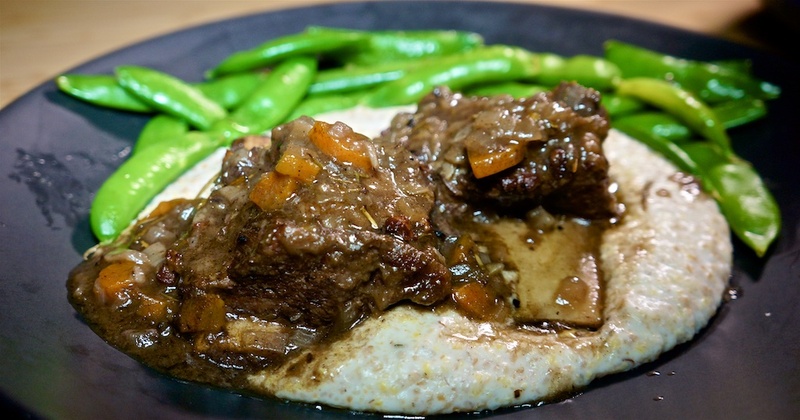 Once again, we paired them with a goat’s cheese polenta mix and served with steamed sugar snap peas. The 10 grain ‘hot cereal’ is $5.99 for a 25oz pack, but we used about 1/8 or 38c per serve. The peas were $2.99 or $1.50 per serve, although we didn’t finish all of them. Dinner tonight cost $14.21 for a very generous serve.